Click to learn more about our new patterns and skincare line. It’s about time! 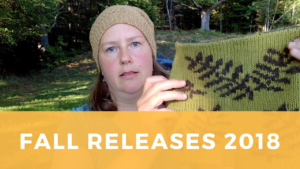 For the past several months you’ve seen and heard me allude to a few new products and I am finally ready to share more information about our 2018 fall releases. Inspired by the scenes of Vermont near our homestead, I developed two new patterns. The Forest Floor Cowl is a double-knit cowl that comes in a kit. This design is inspired by many walks in the forest that surrounds our farm, and features images of ferns and trillium. The base yarn is spun in New England from local sheep’s wool and fiber from our own llamas. In the kit, you’ll receive the pattern with a Ravelry download code, the yarn (with your choice of contrasting color), and a solid lotion bar specifically formulated for those of us who work with our hands. The Bethel Hat is also inspired by local scenery, specifically the Bethel quarry that we can see from our porch. Central Vermont is known for the granite industry here, and this hat features a simple all-over texture in granite stitch. Suitable for men, women, and children, the hat pattern is simple and would knit up quickly for an easy gift. I recommend two different local yarns for this pattern: Mohonk by Jill Draper Makes Stuff, or Mewesic by Green Mountain Spinnery. Something that I’ve been increasingly passionate about over the past decade is sourcing products locally. It started with food, continued into fiber and textiles, and most recently has extended into natural skincare. I’ve never been one to spend hours pampering herself with expensive creams, complicated treatments, makeup, and other products. But like anyone, I do want my body to be healthy and I want my skin to look good. For years, I was using a standard health-food-store moisturizer, but only recently decided to read the label. I was surprised (and a little horrified) to discover I’d been putting fillers and chemicals on my skin for years. In a quest to find a healthier, local solution, I found some information about using rendered animal fats. It sounds odd at first, to suggest smearing lard or beef tallow on your skin. But these fats are highly compatible with our own body chemistry, and are packed with skin-beneficial nutrients and vitamins not found in petroleum or plant-based products. I’ll let you read more about our ingredients if you’re interested. I can personally attest that my skin is healthier, smoother, and more even in tone after six months of using my own natural products than it has been in years. I want to share these items in hopes that you will find similar benefit. All of these products will be available at the Vermont Sheep & Wool Festival, coming up September 29 & 30, 2018 at the Tunbridge Fairgrounds. You’ll find us in the Vendor Pavilion along with our other venture, Vermont Natural Sheepskins. If you can’t make it to the festival, then you will be able to order these items online. Please sign up for our newsletter from the home page to get all the details – and your free copy of The Bethel Hat pattern!